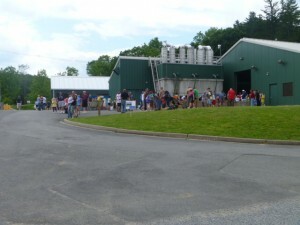 This weekend the New Jersey DEP Division of Fish and Wildlife celebrated the 100th anniversary of the Charles O. Hayford State Fish Hatchery in Hackettstown with an open house. Visitors got a behind-the-scenes look at the grounds and facilities. There were many additional activities including a giant mobile aquarium, fishing in two of the ponds, birding hikes and historic exhibits. 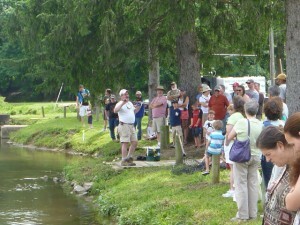 There were also some pretty good demonstrations on musky fishing and turkey calling. 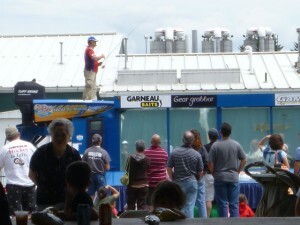 Over 50 vendors of fishing related products also attended. 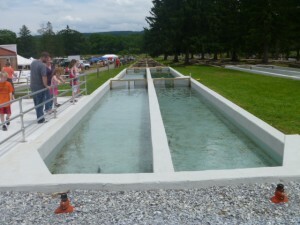 The Hackettstown hatchery is somewhat unique because it raises 15 varieties of fish, including trout, northern pike, muskellunge, walleye, catfish, and hybrid striped bass. 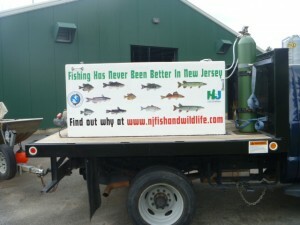 This diversity shows just how good the fishing can be in the Garden State. 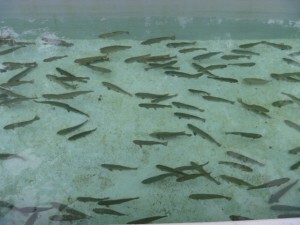 The hatchery also raises gambusia (mosquitofish) as well as fathead minnows and sunfish as part of an integrated approach to mosquito control, a necessity for NJ summers. It was a beautiful day with temps in the mid-70s, so I took my girls for a visit. They had a great time checking out the exhibits and demonstrations, and enjoyed some ice cream and kettle corn. They even participated in a brief scavenger hunt to unearth facts about the hatchery and its history. The raceways and holding tanks contained some large and beautiful fish, destined to find their way into NJ lakes and rivers. I couldn’t help but wish that I’d see some of these fish again on the end of my line. 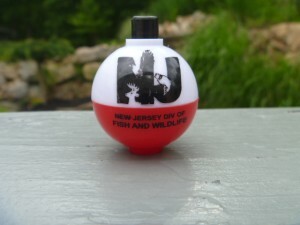 There were also plenty of NJ DEP employees on hand to provide directions and give some additional history. 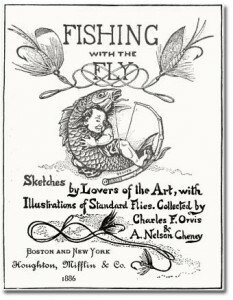 For a history lesson on the hatchery in PDF format click here. Enjoy!